On Sunday night, Tak and I headed over to Fiery Otaared’s Show at Junkyard Blues. Catching Fiery’s show has been one of my favorite Sunday evening activities for a long time, but last night she was playing the amazing tunes of blues artist Gary Moore. Moore had passed away earlier that day and wow, what a loss if you love bluesy music, guitar virtuosity or just great tunes. Nice tribute Mama Fi. A celebration of great music as the Sun goes down on in the Junkyard. 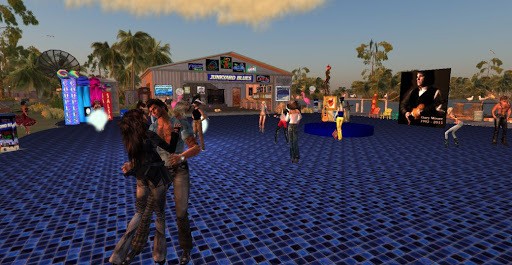 This entry was posted in Journal and tagged Nightlife, Real Life, Second Life. Bookmark the permalink.